Chelan Crest SOTA Outing July 23-25, 2016 – Part 3. See separate report on PNWSOTA website with background on outing and day 1 description. The total trip was approximately 25 miles RT, with approximately 7,000 feet elevation gain, including ups and downs in between the various peaks. This is report 3 of 4, "Olivia Mountain". On maps, this summit is shown as Point 7,492 (feet), lying about 1.06 miles SE of the Big Boy of the neighborhood - Pyramid Mountain. I suspect "Olivia Mountain" is the SOTA name for the peak. We Activated "Olivia Mountain" on the same day as Graham Mountain. The route from Camp to Graham Mountain, back to camp and up and down Olivia Mountain involved approximately 5 miles RT, with 1,700 feet elevation gain. Each segment was approximately half the distance and elevation gain, which is why we chose this centrally located camp site. Again, the open slopes were festooned with assorted wildflowers in full bloom. We saw acres of Lupine, Indian Paintbrush, Daisies, Alpine Collomia and many others that I could not identify. The area also had a large concentration of Larch trees, which we speculated would be magnificent in the fall, when they turn golden in color. The views from Graham Mountain, and especially Olivia Mountain were increasingly impressive. As we penetrated the Chelan Mountains northward, Glacier Peak, the high mountains ringing Entiat River and hundreds of mountains in all directions tested our aggregate experience and recognition. In the far north stood Mount Baker, and in the distant south, we saw mighty Mount Rainier. 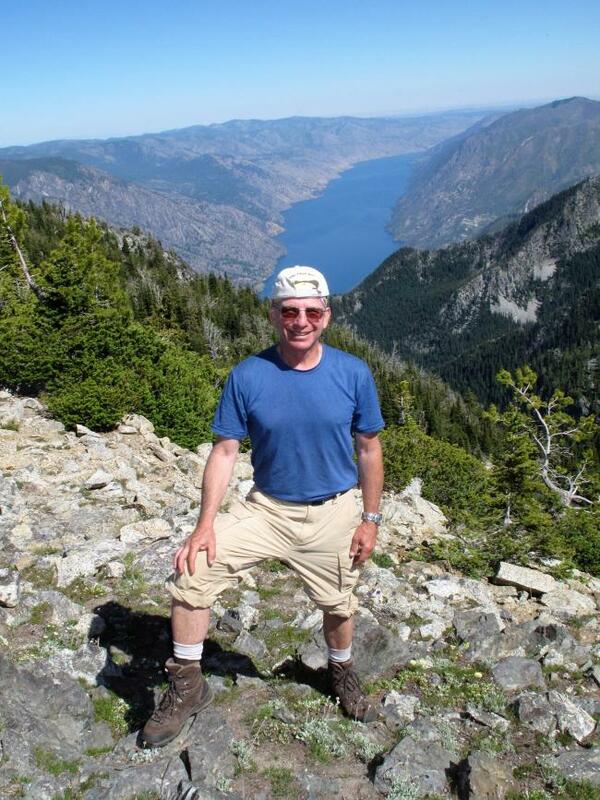 From the summits, Lake Chelan always glistened below us, 6,000 feet and more. Often airplanes serving the route from Chelan to Stehekan flew a few hundred feet above lake Chelan...and yet 5,000 to 6,000 feet below us. The planes and boats plying the Lake Chelan corridor, looked like children's toys from our high vantage points. From "Olivia Mountain" I made just a few contacts as it was later in the day, and band conditions on 40M were not favorable. 2M FM was even more challenging because of the remoteness of the peak. I worked: KF7WKR; K7EHT; KK6RPX; KE7RTV; KI7EWX and KF6FJU. Thank you to all my contacts and "Chasers". I appreciate each SOTA contact I make.